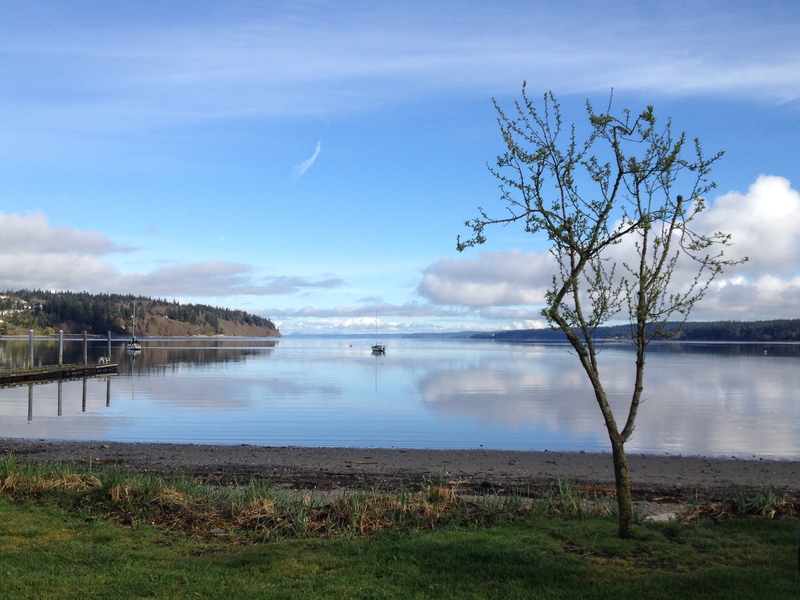 We are back on Whidbey after a 10-day trip to California, happy but tired. 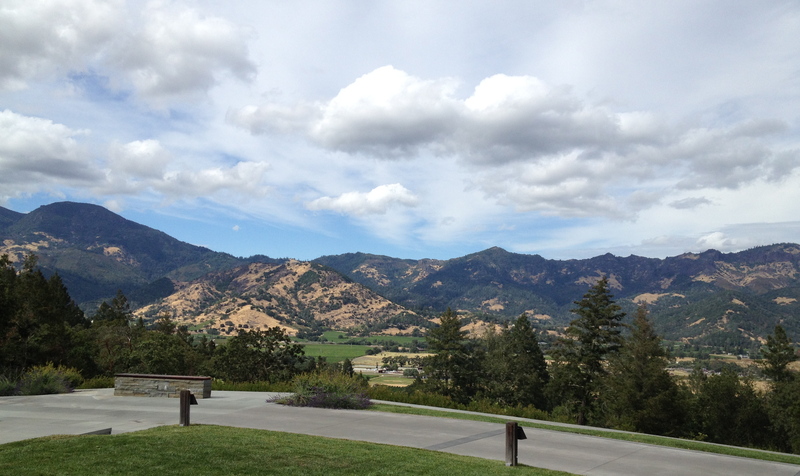 After stops in Oregon, to visit Robin’s mother, sister, and brother, and near Sacramento, to have a couple of minor repairs on the camper, we landed at Corbin and Pam Gwaltney’s beautiful house overlooking Calistoga at the north end of the Napa Valley. Staying at Corbin and Pam’s is like staying at a fine resort where you are the only guests and the hosts are friends who are attentive to your every need. 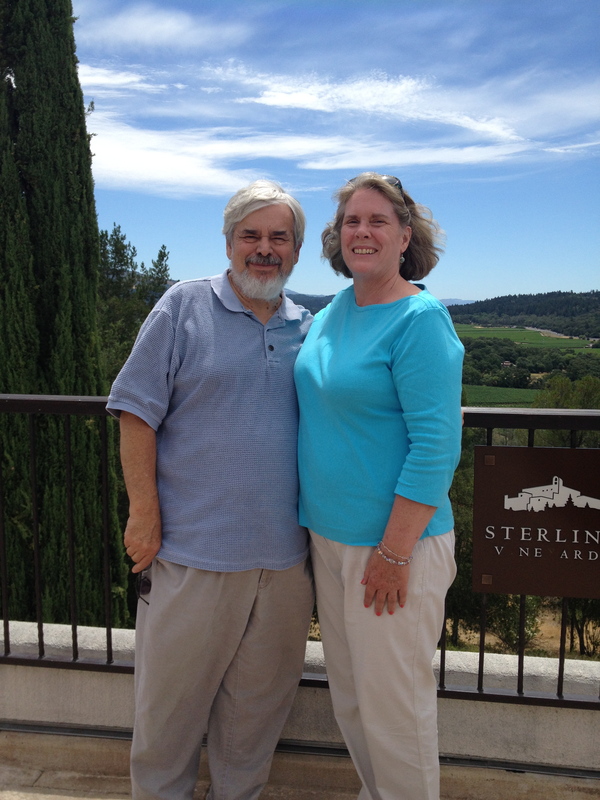 Pam took us to Sterling Vineyards, which says it is the only Napa winery with a tram, which you ride up to take the tour. The tour is self-guided, which means you can amble along at your own pace (slow, for me). Instead of a wine-tasting at the end, as most wineries do it, you get to sample wines as you make your way through. And because you’re so high up, you have terrific views of the valley, providing opportunities for tourist photographs (at right). Corbin and Pam wined and dined us, both at the “resort” and at two of Napa’s many outstanding restaurants: Solbar, at the Solage resort in Calistoga, where we ate outside on a perfect evening, and Archetype, in Saint Helena. At Solbar, I had the duck, which was “gently cooked” — good thing, too, because I hate seeing duck manhandled. And throughout our visit, we were entertained by Jacques the poodle, who specializes in leaping stairs two or three at a time and supervising the opening and closing of the swimming-pool cover. Robin was quite taken with Jacques. It’s a good thing Teddy wasn’t there or he would have been jealous. After two days, we reluctantly departed Calistoga and headed north through the Knights and Alexander Valleys, which Corbin called the most beautiful in the area. He was right. It’s pretty much all wineries, with no commercial development. Then we hit Highway 101, to Willits. where we spent one night at a KOA so we could plug in to “shore power” to charge the camper’s batteries and top off our water and propane tanks. This was our first stop at a KOA, which turns out to be sort of a Holiday Inn for campers. After that, it was on to Laytonville to attend the Kate Wolf Music Festival, which I will cover in my next post. Apparently you don’t much miss Thursdays at the wall…. Actually, I do kind of miss Thursdays at the wall, but not enough to come back.